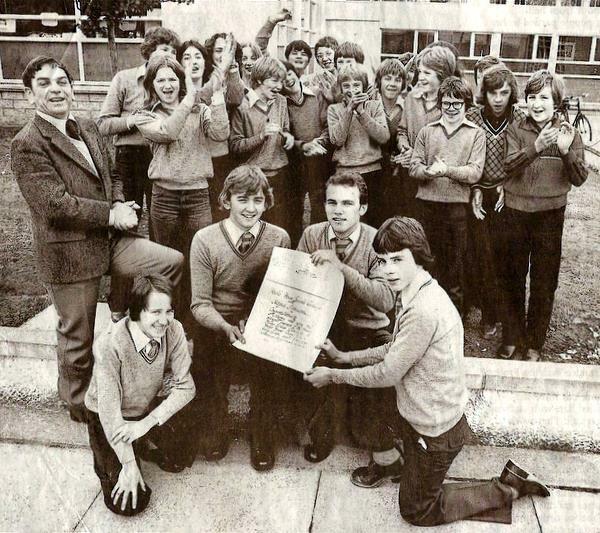 Alford Academy teacher William Smith with pupils celebrating winning the Haddo House Challenge Quiz, 1978 (outright winners over seven teams from Grampian, with Magnus Magnusson as quizmaster). Front row: David Esson, Ian Wattie, Neil Christie, Brian Beaton. I recognize many faces in the background. One in particular is now an ambulance driver in Alford. Another is the former headmaster's son. Another stays opposite the former police station.